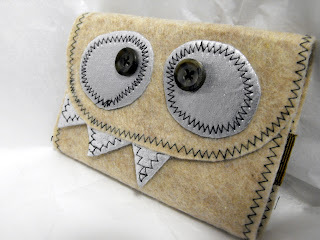 Handmade Gift and Shopping Guide | The Meandering Musings of a Consummate Shopper Handmade Shopping Guide: Snot Monsters, Robots and Aliens.. oh my! Snot Monsters, Robots and Aliens.. oh my! Having the flu is no fun. I want to send out a big thank you to Leal for trying to keep the blog going in my absence though! I think he has a whole new appreciation for the amount of dedication and work that goes into a post-a-day type blog, poor guy. Thank you so much for those that sent me well wishes through twitter, too. I really appreciate the support! Today's shop is a cute one. So cute that the first time I stepped in, they shop made me smile and I fell instantly in love with the little guy pictured here in this post. His name is Rocky Monster, by the way. Not to be confused with Happy, Gleeful, Angry, Rosie or Cocoa, which are also wonderful monsters available in today's shop! ArtsiBitsi (I love the name too!) is a little shop on Etsy that sells a wide variety of different monster and alien ware for you to browse through and adopt. They have everything from backpacks, bags and journals to iPod/phone pouches, Kleenex/tissue covers (called snot monsters), cards, tags, charms and toys. The artist designs all the pieces herself with the help of her 1970's sewing machine named Blanche. They've been a team for some time and if you take a tour through her sight you'll see that they both have terrific fun together too! All the monsters and aliens in ArtsiBitsi are individually designed, so when you stop by be sure to look at all of the photos in the listings to see whether there are special features, like extra tabs, buttons or pockets. 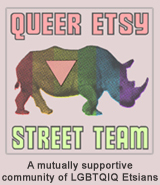 TO VISIT THE ARTISBITSI SHOP ON ETSY, YOU CAN CLICK THE PICTURE ABOVE OR, IF YOU'D RATHER, CLICK RIGHT HERE! Monsters yes, but adorable ones! Whats so fun about monsters is that if they turn out ugly (as some of mine have) you can always say you meant it to be an ugly monster and no one is the wiser...oh, well now my secret is out. Okay, I want one of those. Stopping by from SITS! LOL- very unique! Good for her! Original Hand Painted Jewelry... Beautiful Too!